Arthur Edward Greenup was born in 1902, son of Ernest Greenup, a stonemason and railwayman, and his wife Margaret, nèe Tyler. He was unmarried. He died at Five Dock on 3 August 1980, aged 78. A requiem mass was held at St Joan of Arc, Haberfield, before his burial in the Catholic Cemetery at Rookwood. Arthur Greenup was educated at Newtown Public School. He started work aged 14 as a shop assistant rising to department head. He was an organiser and president of the Shop Assistants Union. He joined the ALP in 1929, holding many executive positions. He was delegate to the Trades and Labor Council from 1933; president and organiser from 1946 until 1950; industrial officer from 1956 until 1972; an vice president of the Shop Assistants Division of the Australian Workers’ Union from 1973 until 1977. Greenup was the was president of Newtown East branch for 13 years. During World War 2, Arthur Greenup was the Chief Warden for the wartime National Emergency Service (NES). He lived at Myrtle Street, Stanmore. In 1950, Greenup became one of the trustees of the newly formed Camperdown Memorial Rest Park. Greenup was elected to the NSW Legislative Assembly for Newtown-Annandale in 1950 until he was defeated in 1952. He was elected as an ALP member of the House of Representatives for Dalley from 9 May 1953 until his retirement on 4 November 1955. 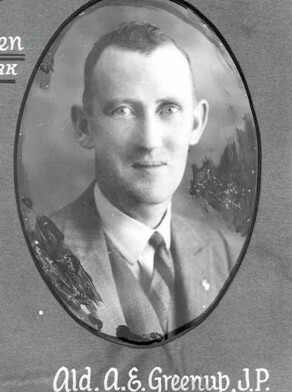 Arthur Edward Greenup was an alderman on Newtown Council in 1938-48, representing O’Connell Ward. He was mayor of Newtown in 1942-43. Greenup was Alderman for Newtown Ward of the Sydney Council, 4 December 1948 to 1 December 1950. He was a member of the Health and Recreations Committee, 1949-50 and the City Planning and Improvements Committee, 1949-50.